Bath Weekly term-time classes at the Claverton Rooms University of Bath. Southampton We host a Salsa, Bachata & Kizomba Fiesta at Medbar Southampton in two Rooms every Sunday from 5pm to 10pm. Please visit our website for the latest info. Bristol New absolute beginner Salsa classes Bristol Monday evenings 8:15 pm -10 pm, followed by freestyle dancing till 10:30 pm in the dance hall Lyde Green Community Centre, North Bristol. Cardiff Regular Salsa dance classes in Cardiff every week. New Beginners welcome every week. Just turn up and pay. Salsa Classes 8pm till 10 pm then freestyle dancing. See website for all details. Zumba® Kids Jr. is designed exclusively for kids 4 to 7 years. Drop in: £5. 4.30 - 5.00pm please arrive 5 min earlier to register. Zumba® Kids is designed for kids 8 to 13 years. Drop in: £5. The Dancier, low-impact version of Zumba® without compromising on the Fun! The Zumba Gold® formula has the moves and pacing to suit the needs of participants on a journey to a fit and healthy lifestyle. Bath Stunning new venue for Salsa. Space for 3 classes covering complete beginners to intermediate/advanced. Followed by DJ Marco 'til late. Start any week. Unit 2 Millennium Promenade | Harbourside, Bristol BS1 5SZ, England. Bristol Classes on hold till we find as new venue for Tuesdays, check out the link for our other classes. Bristol Weekly Bachata classes and dancing in Bristol. Glastonbury Great venue, next to Bocabar. 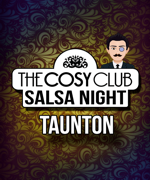 Bristol Salsa & Bachata dance classes in Bristol every Wednesday night. Beginners welcome every week. Just turn up and pay. Freestyle salsa dancing from 10pm till late. Learn cross body style including technique and ladies styling, with Cressida, Bristol's original salsa teacher! Malmesbury Kizomba class for all abilities. Friendly, supportive atmosphere and professionally qualified teacher. 8.40pm - 9.00pm Social dancing. Free to class attendees. 8 week Rueda Course for all levels of Salsa dancers plus 5 levels of Crossbody salsa for complete beginners up to advanced levels. Fun, friendly environment. Bristol Regular Friday parties with guests. Classes from 8 pm till 10 pm and dancing from 10 pm till 2 am! Salsa & Bachata dance classes. See website to see party dates and who the guest teachers are. See website for all details! Winchester Zumba® Dance Fitness with Silvia and Max at the River Park Leisure Centre in Winchester. Party to Salsa, Merengue, Cumbria, Reggaeton & more! Please arrive 10min early for registration! Southampton Hedge End Rueda runs Weekly Rueda de Casino Classes Every Saturday 1.00pm - 4.30pm . Beginners 1.00pm - 2.30pm. Intermediate Advanced 3.00pm - 4.30pm. Beginners must already know the basic salsa step before. Inter/Adv must be experienced Rueda dancers.